What is the Manhattan MLS? Where can I do a Manhattan MLS search if I want to buy property in Manhattan? How do I list my home on the MLS in Manhattan? What’s the difference between REBNY vs MLS in NYC? What is the Manhattan MLS? Why Was the Manhattan MLS Not More Popular? Where Can I Search for Manhattan MLS Listings? The Manhattan MLS was a formerly independent Multiple Listing Service (MLS) operated by the Manhattan Association of Realtors (MANAR) based in the New York City borough of Manhattan. The Manhattan MLS and MANAR were absorbed via merger in 2016 by the significantly larger Hudson Gateway Association of Realtors (HGAR) which operates the Hudson Gateway MLS (HGMLS). MANAR and the Manhattan MLS never became popular in NYC due to stiff competition from the Real Estate Board of New York (REBNY) and the inter-broker shared listings database it operates called the REBNY Listing Service (RLS). MANAR was actually the only local Realtor organization in Manhattan given that REBNY seceded from the National Association of Realtors (NAR) in 1994. As a result, REBNY brokers and agents are not Realtors since that is a trademarked designation reserved for NAR members only. Furthermore, the REBNY RLS is not a MLS since a MLS is traditionally a term reserved for broker databases operated by local Realtor associations. The Manhattan MLS was a noble but ultimately underfunded effort to establish a legitimate, Realtor affiliated Multiple Listing Service in NYC. Unfortunately for MANAR, REBNY was already too established in the city for MANAR to lure member brokerages away. All of the larger and major brokerages balked at the prospect of having to pay two sets of membership dues, and many did not see the usefulness of joining the Manhattan MLS when most listings were on the RLS. Keep in mind that REBNY used to be the major NAR affiliated, local Realtor organization in New York City. Furthermore, REBNY has had a long history in New York City when it was first created in 1896 (originally organized as the Real Estate Board of Brokers of the City of New York with 27 members that met at 59 Liberty Street). Moreover, MANAR did not have enough financial firepower to make a major recruitment and marketing push in Manhattan as a standalone entity with relatively few members. REBNY membership dwarfed MANAR membership when it existed, and MANAR could not hope to outspend REBNY in marketing and advertisements. Given the recent merger1 with the HGMLS and the currently contemplated merger between the Hudson Gateway MLS and the Long Island MLS, there is a lot of potential for a more dominant MLS in Manhattan in the future. Assuming that a merger between HGAR and the Long Island Board of Realtors (LIBOR) happens, the resulting Realtor association will no doubt be the largest in the country. The HGMLS already covers Westchester, Bronx, Orange, Putnam, Queens, Dutchess, Ulster, Rockland and Sullivan Counties. Meanwhile, the Long Island MLS covers Nassau, Suffolk and Queens County. Both also have a presence in Manhattan. As a result, a combination would result in coverage from Manhattan throughout the Greater Hudson Valley to the north, and all of Long Island to the east. If there was a way for REBNY to join the fold at this point, the dominance of this new broker association in all of Southern New York would be unquestionable. There would also be a collective sigh of relief from brokers who have to deal with multiple MLS systems within the same city. No longer would brokers have to become members of several MLS systems just to work in the same city. It would not only save money, but be much more efficient! 1The Manhattan MLS and MANAR were wholly absorbed by the much larger HGMLS and HGAR in 2016, when HGAR officially started its Manhattan chapter. If you’re buying in Manhattan, the first thing many folks will do is to figure out how to do a Manhattan MLS search. That’s because the local MLS is the most accurate source of property listings data in most parts of the country. However, a Manhattan MLS search is not the best way to approach buying a home in NYC because the Manhattan Multiple Listing Service only has a fraction of the listings that the RLS has. As of today, REBNY RLS is by far the dominant, de facto New York City MLS with over 16,000 local members. Furthermore, the RLS does not have a public search portal unlike most MLS systems. As a result, you’ll need to work with a local buyer’s broker to properly access and search for listings on your behalf. Better yet, work with one of our great buyers agents who have access to both the HGMLS and the RLS. Why miss out on any potential Manhattan listings that might not be in the RLS? Even though the Manhattan MLS no longer exists independently, there still is a Realtor operated MLS in Manhattan via the HGMLS. If you’re interested in listing your home on the Manhattan MLS, you’ll first need to submit your listing details for the HGMLS. Our online form takes under 5 minutes to complete, though please be warned that the HGMLS requires more listing information than the RLS. If you have time to show your own home and manage the sale process, we recommend purchasing our List Your Home Online product. 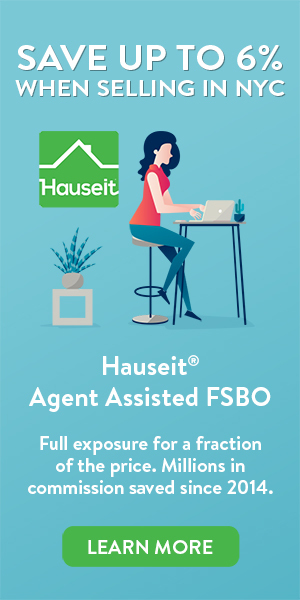 This owner managed, self-service listing option is called an Agent Assisted FSBO. You’ll receive the identical marketing exposure for your home as if you paid the typical real estate commission in NYC of 6% to a traditional real estate broker, but all you’ll owe is a small one time flat fee paid upfront. Please note that you’ll still need to offer a For Sale By Owner Buyers Agent Commission in the HGMLS. Some form of compensation offered to buyers’ agents is required for entry. Note: For an additional fee, you can list your home FSBO in the HGMLS and the REBNY RLS for comprehensive coverage. Contact us to learn more! If you’re too busy to manage your own sale, please check out our very affordably priced Agent Managed Listing option, which provides sellers with full service for a 1% listing fee. Please note that the 1% listing fee does not include the buyer agent’s fee. You should offer a market rate commission to buyers’ Realtors so they will be motivated to show your property. Note: Even though the RLS is the de facto New York City MLS due to its overwhelming popularity, it is still not technically a MLS since it is not associated with NAR. REBNY RLS – What Is the REBNY Listing Service in NYC?